I decided that the bike would be the mode of transport for the exploration of the Angkorian ruins, a rather enjoyable choice. First stop was obviously the world renowned Angkor Wat. 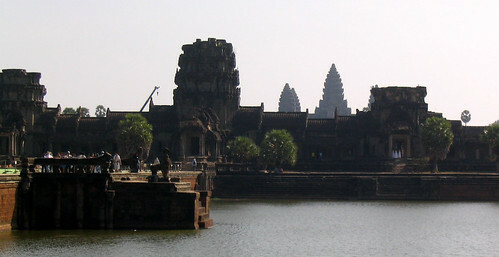 What can I say about Angkor Wat? It’s indeed monumental, scaling it is such an exercise that I’m beginning to wonder how did the Khmers manage to do it on a daily basis, not to mention in a dignified manner, since I had to climb on all fours. One also has to wonder at the amount of work put into buidling this 4 storey wonder, with its stones, and carvings telling the story of the Ramayana. (or is it the Mahabharata?) Apparently its spiritual function is still in use, as some of the more favoured gods are still objects of worship to this day. Next stop was the Bayon found within the massive Angkor Thom complex (4km by 4km) guarded by statues that seem to be chained together. 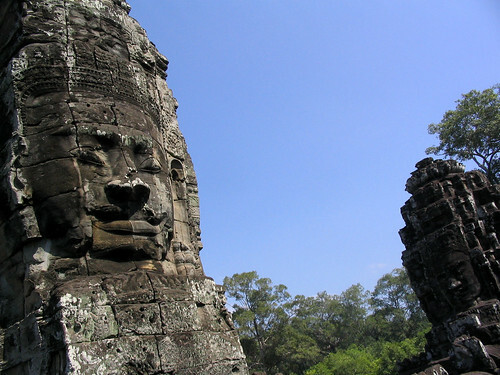 Bayon is a temple filled with faces of the Boddhisatva, rumoured to be modelled closely to Jayavarman 7’s face, the builder of the Bayon. (I guess it’s his way of gaining merit) facing the four cardinal points of the compass. As with anything famous, it was swamped with tourists bus-ed in by the loads, but well, one can’t miss it only because it’s crowded? 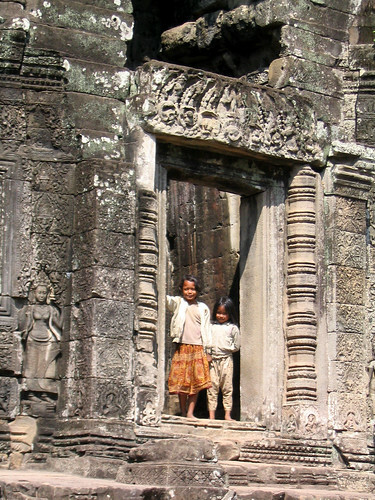 After visiting the Bayon, I decided to take a whirlwind tour of the marked 14km mini-tour of the temples which included the Chau Say Tevada, Ta Keo, Ta Phrom, and Banteay Kdei. Chau Say Tevada was under conservation; Ta Keo fits into my mental image of how the tower of Babylonia should be, with its pyramidal structure and its pinkish sandstone. While I didn’t get to peek into the Ta Phrom, its walls seemed to run on forever and ever as I was cycling, quite a massive complex! Hunger pangs put my plans of going on the 26km grand tour on hold, and I went back to my usual fried rice stall for my one dollar fried rice. After lunch, a shower seemed to be a good idea, though of course, sleep overtook me, resulting in the shelving of the plans to go on the grand tour. I decided to be more adventurous for dinner, and went to Siem Reap town to explore the options. In the end, I decided on The Red Piano (its claim to fame being the bar that Angelina Jolie patronised when she was filming Tomb Raider). The fish and chips were superb, with the fish fried in a light batter, and smothered in a creamy sauce with the slightest hint of lemon. Yummy!